What the heck is a Geoscientist and how does the work they do help highway travel in BC? March is National Engineering and Geoscience Month in Canada and also the month for “Expanding Girls Horizons in Math and Science”, can you tell us what made you interested in geoscience as a career? I’ve always been curious and excited about science and nature but it wasn’t until I took a geology elective during first year university that I really became interested in the earth sciences. As I learned more about geology, I knew this was the path for me. Historically, engineering and geoscience were male dominate careers, but I have been fortunate to have some incredibly knowledgeable female mentors in the Math and Science fields. Geoscience is an incredibly rewarding career, and I would encourage any girl (or guy) who likes nature, math, and science and doesn’t mind getting dirty to give it a shot! Can you explain what you do as a geoscientist with the Ministry of Transportation and Infrastructure? I use my training as geoscientist to study the earth with the specific focus of understanding human interaction with the land, to predict or anticipate geological issues and provide measures to help minimize impacts on the environment. I work with project managers, operations staff, and the gravel management team to make sure we leave the environment surrounding our highways in an optimal condition. Some of my duties include collecting and analyzing soil, rock and water samples and interpreting geological information from maps, reports, satellite imagery and geochemical surveys. What does a typical day at work looks like for you? I spend a lot of time reviewing soil and ground water chemistry and drilling logs to get a better picture of the underground environment and to determine if any kind of remediation is necessary. 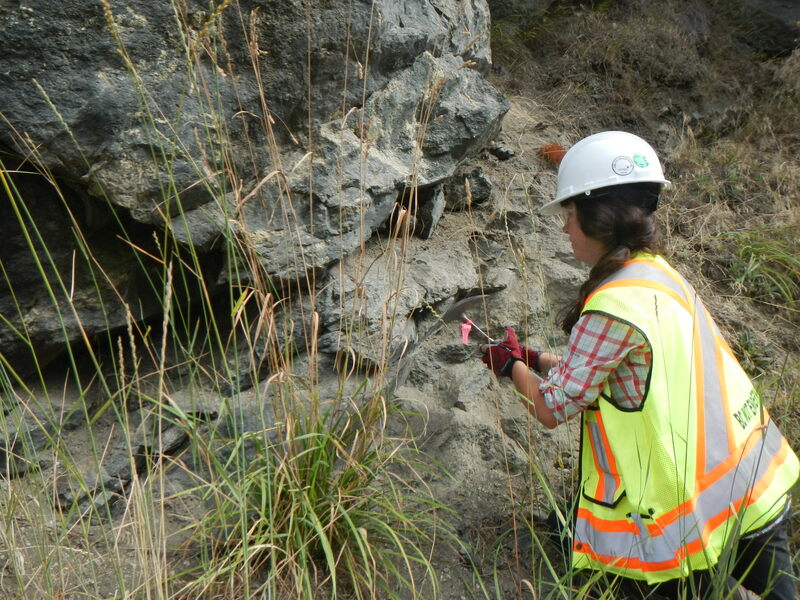 Alexandra in the field collecting samples at Beasley Bluffs near Nelson, BC. 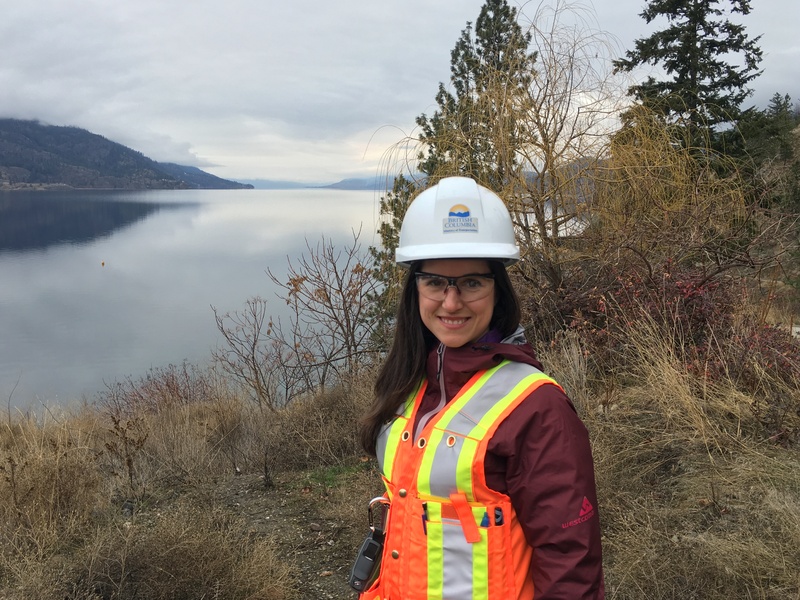 I use information from government databases such as the BC Geological Survey and the Fresh Water Atlas, satellite imagery, air photos and geological literature to understand the underground geologic conditions at each site. While I spend a lot of time in the office, I do get to work outside in some beautiful places around our province. What kinds of projects do you work on with the ministry? Thanks for taking the time to chat with us Alexandra! Now that you know the role geoscience plays on BC Highways – do you have any questions for us – about this or any other work we do? Let us know in the comments below. Thanks for connecting with us here and sharing your concern about the Sunshine Coast Feasibility Study. Here is a link to more information about the plan, and an email address for you to send your concerns directly about the study.